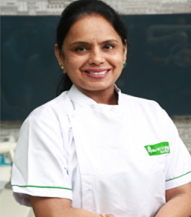 Dr. Rathika Rai is a Consultant Prosthodontist and has 20 years of clinical expertise.Dr. Rathika Rai currently pratices at Apollo White Dental in Anna Nagar, Chennai. She completed BDS from Ab Shetty Memorial Institute Dental Sceince Manglore University in 1992 and MDS – Prosthodontics from Ab Shetty Memorial Institute Dental Sceince Manglore University in 1998. She is Specialised in crown and bridge with special interest in the field of Cosmetic dentistry.She has vast experience in clinical administration.She has a fellowship in Implantology from Nobel Biocare,Sweden and also a fellowship in Laser Dentistry.She has many Publication in various indexed Journals.She is also the Principle at Thai Moogambigai Dental college & Hospital and also heads the Department of Prosthodontics. She is a member of Indian Dental Association,Member ISOI,Member of Pierre Fauchard Academy and Member of Indian Prosthodontic Society. Areas of Expertise : Cosmetic Veneers/BondingRestorative Implantology,Porcelain Veneer,Smile designing,Full Mouth Rehabilitation.